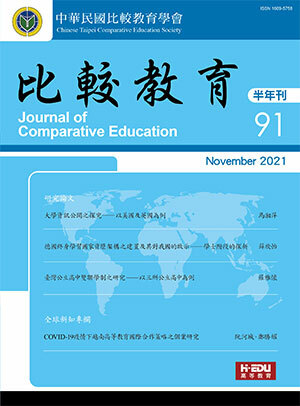 Journal of Comparative Education (JCE) is an academic periodical of the Chinese Comparative Education Society – Taipei. JCE provides a forum to discuss the issues regarding international and comparative education, the latest educational information around the world, and book reviews to convey a brand new worldwide vision. By submitting a paper to "Journal of Comparative Education" the author accepts this Publication ethics statement. All papers submitted to "Journal of Comparative Education" are subject of a peer-review process by at least two international reviewers who are experts in the field of the submitted paper. The criteria taken into account in the review process are quality, significance, originality, innovation, relevance, and language. Possible decisions taken by "Journal of Comparative Education" Editorial Board are acceptance, acceptance with revisions, or rejection. There is no guarantee that a revised paper will be accepted. Rejected papers will not be re-reviewed. All papers submitted to "Journal of Comparative Education" should have a relevant reference list of references. All "Journal of Comparative Education" papers should be original. Plagiarism in any form and fraudulent data are not acceptable. "Journal of Comparative Education" does not publish papers with same exact material from another journal. their papers are their original work; their papers have not previously been published elsewhere; all sources used in the creation of their papers are identified; all data in the papers are real and authentic; all authors (in case of co-authorship) have significantly contributed to the research. participate in the peer review process; provide retractions or corrections of mistakes; report any errors they discover in their published papers. Reviews should be conducted objectively, fairly, with no personal criticism of the author. Reviewed papers should be treated confidentially. be academically qualified to review the paper; have no conflict of interest with respect to the research, any of the authors, research sponsors, companies or institutions; express their views clearly with supporting arguments; identify relevant published work that has not been cited by the authors and/or any substantial similarity between the manuscript under consideration and other published papers. Editors have complete responsibility and authority to reject or accept a paper. have no conflict of interest with respect to papers they reject or accept; guarantee the quality of papers; only accept a paper when reasonably certain; preserve the anonymity of reviewers; ensure that all papers they publish conform to internationally accepted ethical guidelines; promote publication of correction or retraction, when errors are found. The Editor-in-Chief of "Journal of Comparative Education" has the authority to take final decisions on the acceptance and rejection of a submitted paper after examining the reviews and consulting other editorial board members when appropriate. The Editor-in-Chief should not use any prejudice against authors and should not have any conflict of interest with respect to papers under consideration. safeguarding the publishing ethics; maintaining high levels of intellectual and scientific standards, without the interference of commercial revenue and business needs; protecting and enhancing the peer review process; publishing corrections, clarifications, retractions and apologies when needed; ensuring that plagiarism and fraudulent data are not tolerated.